The great progress made during recent years in the means of generating electricity will excite in many minds a lively interest respecting the genesis of the Dynamo-electric Machine, which, in its various applications to the arts of life, now figures so largely as a factor in modern civilisation. The following correspondence will, it is thought, be of use to those desiring information on the subject, but who, from various circumstances, may not be able to examine for themselves the documents and publications referred to therein. Since the date of the award to me of the Albert Medal of the Society of Arts, I have found that the apocryphal statement (page 20) that the term dynamo-electric machine was first used by Werner Siemens in his communication to the Berlin Academy of Sciences, January 1867, and applied to the machine of his invention, has, unfortunately, been reproduced in Dr. Murray's Oxford Dictionary of the English language under the word "Dynamo." 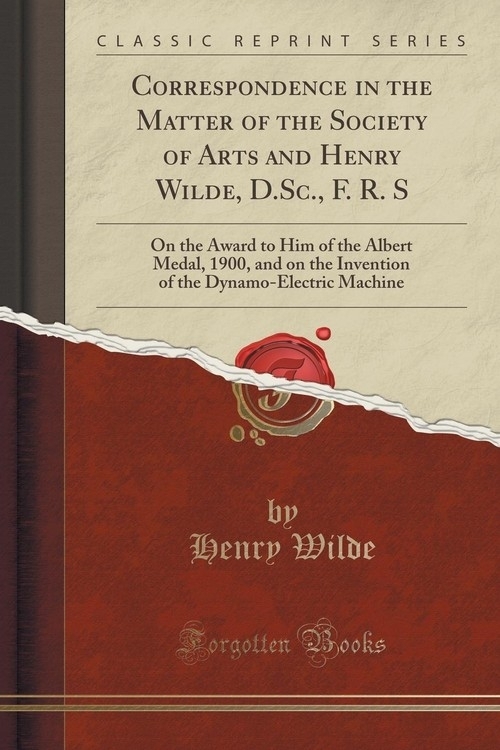 That the term dynamo-electric machine is not strictly logical in its application by electricians exclusively to machines based on the principle of my discovery, as formulated in the terms of the award to me of the Albert Medal, is fully recognised by authorities on scientific nomenclature. Now, however, that the term, with this signification, is incorporated in the English and other languages, and was expressly applied by Brooke, its inventor, to denote the machine of my invention, it is no longer competent to any one to go behind, or to alter the original designation of Brooke, as set forth in his communication to the Royal Society in March 1867.